The stylish Rochelle Office Chair Black is a superb item for any study or computer table round the home, providing high levels of practicality as well as striking visuals. A comfortable and stylish office chair, the Rochelle is a fantastic item. 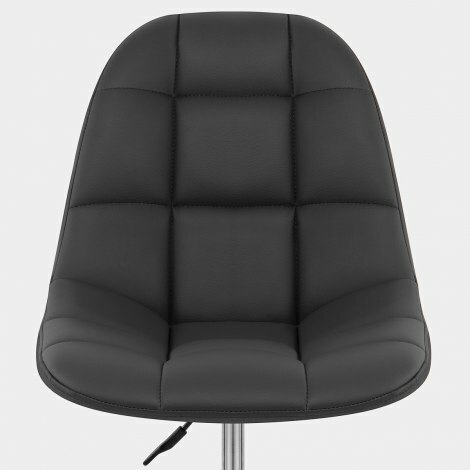 The ergonomically formed seat is padded with high density foam for comfort, upholstered in luxurious black faux leather found on the entirety of the seat including the tall, supportive backrest. Detail stitching segments the seat into a quilted look that has a retro touch, whilst contrasting with the frame below. The chrome-plated 5-spoke base ensures stability and has nylon castors for fluid movement over any surface from carpet to wood. Between this and the seat is the gas lift mechanism, which allows you to freely rotate through 360 degrees and raise or lower the seat as you see fit. "They are so comfy and look amazing"
These chairs were bought for use with a salon they are so comfy and look amazing! I bought this chair for my office which is under the stairs so very limited on space. Its compact and fits perfectly. It was very easy to assembly. Cost effective next day delivery, arrived without any damage, easy to assemble (5 mins max). Cheaper and much better quality than the usual guitarist stools, plus on castors so you can move between effect pedals without having to stand up! Very comfortable, firm and supportive to lower back. Retro style chair, perfect for my little office. Quick delivery and a decent price. A great looking chair, well built and perfect for my needs.